Oh, Sweet Bunny, here's hoping you misunderstood, and she meant to say something, well something, better. I think some bunny slave did a nice clean-up of cardboard shreds just before this photo! I wonder what an "after" photo looks like! Also, somebody give that Rex a good long cuddle and petting. That will make your life all worthwhile! Do you see the dainty mouf-sized nibble on the cardboard box? 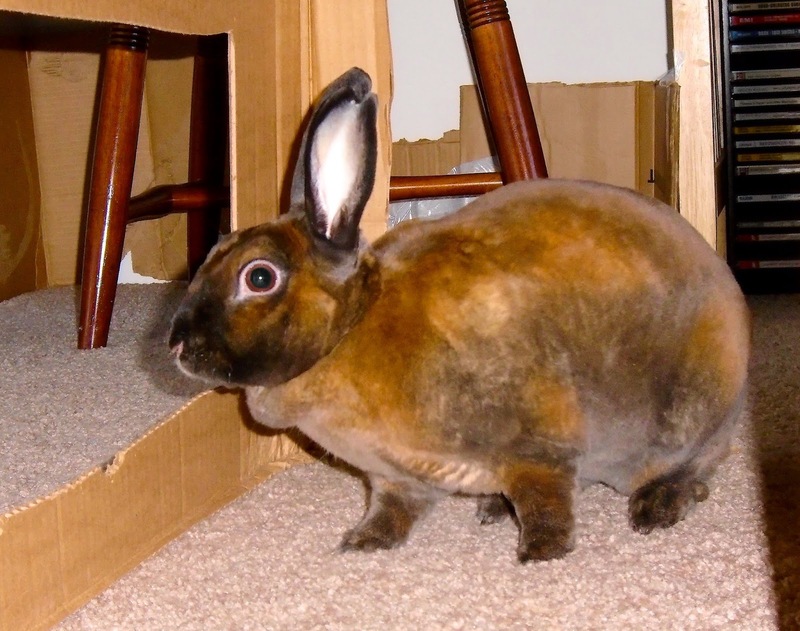 Surely no hoomin could shirk their BunChores for a rabbit with such gorgeous Rexy fur as Penny's! And what beautiful colours she has on her fine bunny coat! Penny looks purposeful; she has bunny business ("bunniness"?) to do, and she can't hang around tidying up the mess caused by us hoomins! So we'd better stop hanging around and start doing those BunChores quickly, thoroughly, and efficiently.